He's almost a world record holder! Thousands of cats have come through the doors of Animal Care Centers of NY (ACC) — but none have been as big as Barsik. 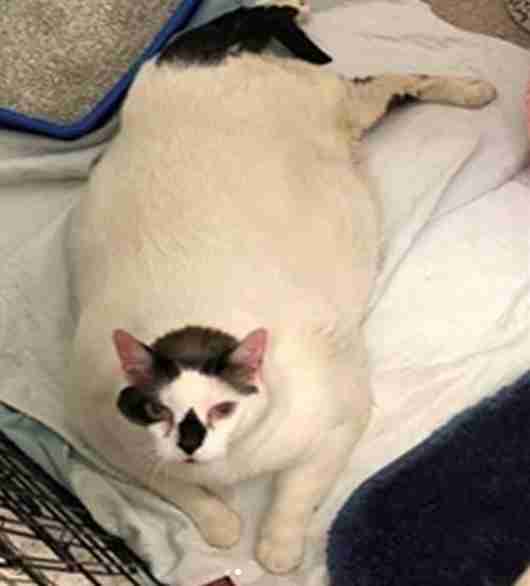 The 5-year-old cat, who weighs a whopping 41 pounds, left staffers stunned when he and his normal-sized housemate, Sukie, were brought to the shelter Friday. According to Barsik’s Instagram page, the cats found themselves homeless when their family decided to move and couldn’t bring pets with them. The shelter wasn’t quite equipped to handle a cat of Barsik’s enormous girth. 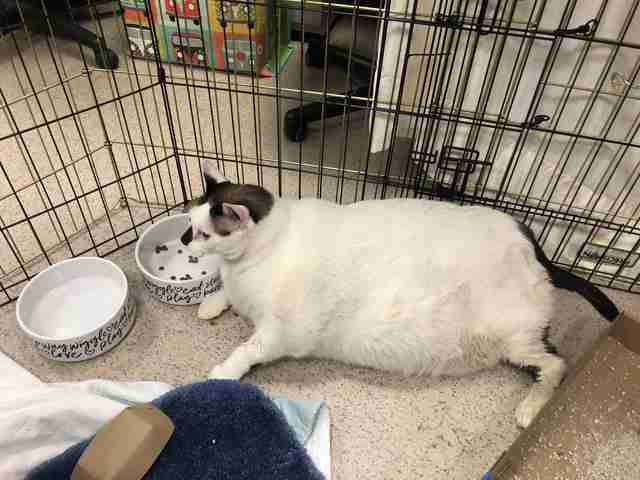 The tabby, who is just 5 pounds shy of the Guinness World Record for fattest cat, was too large for the normal cat kennels, so the staff was forced to improvise with his housing. Luckily, Barsik and Sukie didn’t have to wait long for Anjellicle Cats Rescue, a nonprofit cat rescue located in New York, to pull them out of the shelter and place them in a foster home. But moving Barsik to the home of his new foster mom proved to be a massive challenge as well. Barsik was wary of his foster home at first and tried to hide. But at 41 pounds, he was unsuccessful at squeezing between furniture. Barsik's large size limits the range of his movement, and carrying around the extra weight is clearly uncomfortable. But Luzzolino sees sparks of a cat who really wants to be active and loving. "He has difficultly getting up from lying down and he can't jump at all," Luzzolino told The Dodo. "You can tell he desperately wants to come up onto the bed with us but he's unable to on his own and he doesn't want to be picked up." "It's very sad to see him grooming himself," Luzzolino added. "He can't reach his back legs or rear half of his body. We have started brushing him to get his coat in better shape and will start using some waterless shampoo to help him out." Luzzolino is wooing the wary big-boned cat with soft blankets to sleep on, pets and — Barsik’s favorite — plenty of food. Barsik is heading to the vet on Friday, but until then, his new family can’t make any sudden changes to his diet, which could lead to fatty liver disease. And Barsik certainly doesn’t mind being spoiled one bit. 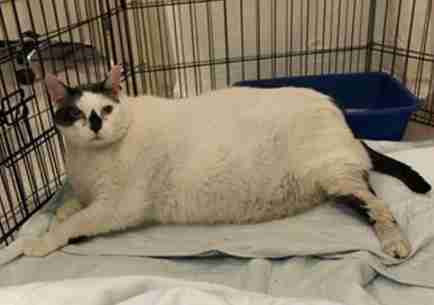 Barsik will soon be on a strict weight loss regimen, and when he’s healthy, he will be ready to find a forever home. 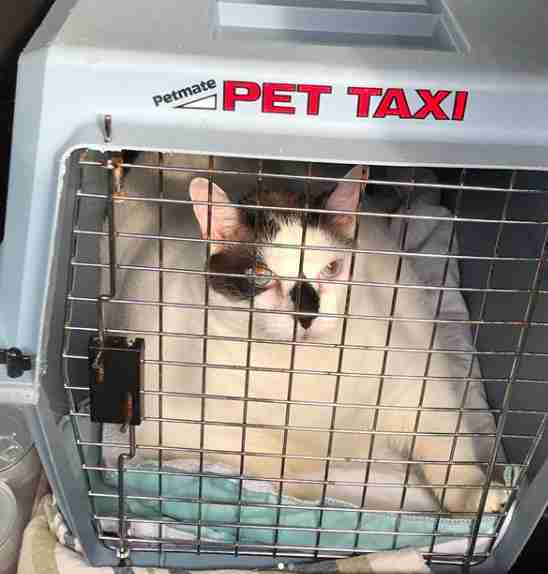 He’s currently one of the fattest cats alive, but with so many people rooting for him, it’s unlikely he’ll stay that way for long. If you would like to help with Barsik’s care, you can make a donation to Anjellicle Cats Rescue. To learn more about Barsik’s weight loss journey, you can follow him on Instagram.